Patios are among the most worthy additions to any residential property, given the range of benefits that they can provide. And when it comes to designing and building these awesome outdoor add-ons, we at Creative Earthscapes are among Ohio’s most trusted companies. 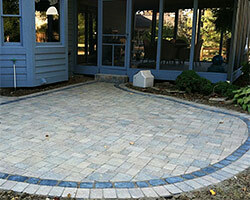 We have been creating patios for property owners in Reynoldsburg, Columbus, Upper Arlington, Lewis Center, and Grove City. Over the years, we have slowly but surely made a solid reputation as a reliable company offering value-for-money installation services. Our goal is to build for our clients outdoor amenities that they will enjoy for decades. Increased property resale value – Whether or not you will eventually sell your commercial or residential property, that patio that you have will increase your property’s market value. This makes a patio a truly great investment on your part. Aesthetic boost – Having a patio will dramatically increase your outdoor’s appeal, especially if it’s installed by professionals like us. With our creative team and skilled installation personnel, you can expect a patio that is absolutely captivating in any aspect. Added functionality – Patios are a must-have in any property because of the functionalities that they render. They make unused spaces in properties productive and turn them into areas of rest and relaxation where you can enjoy fun moments with your family and friends. Our design options are varied and can easily complement existing property themes or satisfy individual design preferences. We can build attached and detached patios, as well as roofed and open types. You may also choose from modern, colonial, Mediterranean, and Old World themes. Whichever of these options you choose; rest assured that your patio will be a visually appealing feature that will blend well with your other landscape amenities. Meanwhile, we can add other features that can make patios more functional and eye-catching. Other amenities that we can install near or around these outdoor living amenities include fire features, a built-in kitchen, pergola, gazebo, fountain, stairs, koi pond, or mini-waterfalls. Simply tell our design and installation teams your desired add-ons, and they will incorporate them in the patio design plan. We believe that choosing the right materials is tantamount to ensuring the success of any patio creation project. With this in mind, we only use or recommend the best materials that we can get our hands on. We recommend premium pavers and natural stones, as well as high-quality wood or timber for those who wish to add such accents to their patios. Our materials come from the most reliable manufacturers, so you’re assured that you won’t be short-changed in terms of the quality of materials that will be used in your patio. 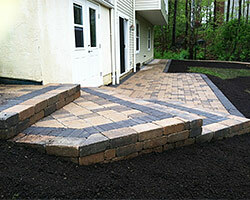 We at Creative Earthscapes combine functionality and aesthetics when creating patios for our clients. In fact, we have on our list good testimonies from homeowners in Reynoldsburg and other Ohio cities that we serve. Our rates are truly easy on the budget, yet our workmanship is simply exceptional. If you wish to know more about our patio design-and-build services, or you want a price quote, please call us today. Start enjoying all the great perks of owning a professionally designed and built patio by calling us at (614) 322-3333.